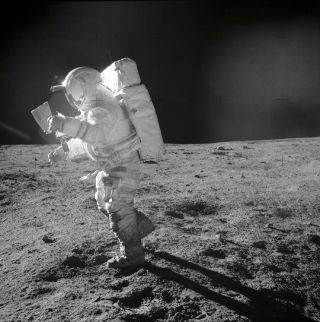 Astronaut Edgar Mitchell refers to a map as he moves across the Moon's surface. In this historical photo from the U.S. space agency, Astronaut Edgar D. Mitchell, Apollo 14 Lunar Module pilot, moves across the lunar surface as he looks over a traverse map during extravehicular activity (EVA) on Feb. 6, 1971. Lunar dust can be seen clinging to the boots and legs of the space suit.